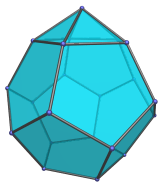 The augmented dodecahedron (J58) is the 58th Johnson solid. 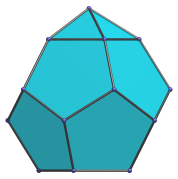 It has 21 vertices, 35 edges, and 16 faces (11 pentagons and 5 triangles). 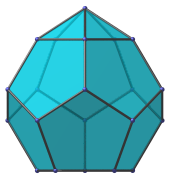 It can be constructed augmenting a dodecahedron with a pentagonal pyramid. 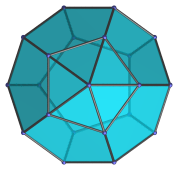 Adding a second pentagonal pyramid on the opposite side produces the parabiaugmented dodecahedron (J59). Adding the second pyramid to a face one edge away from the first pyramid produces instead the metabiaugmented dodecahedron (J60). where φ=(1+√5)/2 is the Golden Ratio. Last updated 10 Jan 2019.